Heads up! 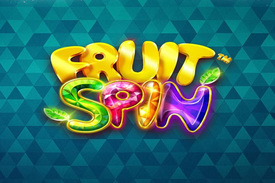 Fruit Spin Video Slot is a new game for high rollers by NetEnt. Indeed, don’t be fooled by the cute fruit graphics if you’re a casino newbie. Because actually, this slot has the potential to take your bankroll on a serious roller coaster. Indeed, Fruit Spin is a high volatility slot, and it’s better suited for experienced players are for those who’ve made a large deposit to maximize a casino bonus. So, if you’re a novice or casual player, we cannot recommend you to try this game. Instead, you should try Emoji Planet, Hook’s Heroes or Glow. But if you’re a thrill seeker or a high roller, make sure to read what’s next, this game won’t disappoint you! In short, Fruit Spin has 3 main features, but know that you’ll need a bit of patience to activate the bonus. Which shouldn’t really be a surprise to you since as we said before Fruit Spin is a high volatility slot. And by default, high variance games tempt to reach their true payout potential in the bonus games. But sometimes the bonus features are not easy to trigger, which makes you appreciate them a whole lot more. Anyhow, let’s look at the features into closer details. The 3×3 Wild and Scatter. Even if they’re two different symbols with different purposes, it’s worth knowing that they’re both colossal symbols and they’ll take 9 spaces on the game grid. In short, the 3×3 Scatter symbol will trigger the Free Spins bonus game, where the 3×3 Wild symbol is in play. The Lucky Wheels and the Free Spins feature. As we said just above, the Free Spins bonus is activated by a 3×3 Scatter Symbol. In short, this symbol will trigger the 3 lucky Wheel mini-game where you’ll win coins (between 20 to 80 per wheel) and Free rounds. Know that the minimum amount of Free Spins you’ll activate is 5 and that the 3×3 Wilds symbol can land at any time in the central reels to create a big win while you play your Free Spins. If you’re a fan of classic slots and if you happen to be a high roller, this game sure won’t let you down! Indeed, let’s be frank, this is very uncommon for NetEnt to release a high volatility slot. And what’s even more unusual is that this game has a max bet of $400 which is very high for NetEnt games! Maybe, NetEnt was trying something new with this release? We’ll let you be the judge of its success… So, head over to one of the NJ online casinos listed on this page if you dare to try Fruit Spin!